The year 1900 was marked in Paris by the International Exhibition (Exposition universelle et internationale de Paris). Held from 15 April to 12 November, it was a celebration of the past century’s achievements and the potential for their further development into the next. The official exhibition announcement was made in 1892, the year Mucha began to enjoy moderate success as a book illustrator. The budget for this massive enterprise was finally decided in 1896, and after that the preparations progressed in full swing, in parallel with the growth of Mucha’s artistic reputation. In 1897, Mucha was fully integrated into the Parisian art world with his successful one-man exhibition at the Galerie de la Bodinière followed by a major show at the Salon des Cent. La Plume magazine dedicated a special issue to this exhibition and Mucha was a ‘hot’ topic within the city’s artistic circle. Over the next two years both Parisian firms and government officials approached Mucha with commissions for projects for the 1900 exposition. The commissions included not only advertising posters and other graphic works, but also the installation of display stands and the design of exhibition halls, which provided him with an opportunity to work with a three-dimensional space. Furthermore, Mucha began to work with Georges Fouquet (1862-1957), a leading Parisian jeweller and goldsmith; his collaboration with the jeweller led him into new territory – the complete design of Fouquet’s new shop, both interior and furnishings as well as the shop-front. The boutique Fouquet was opened in 1901 in the rue Royale, the heart of Paris. It received great critical acclaim, regarded as ‘a shop of a new type’ raised to the level of art, where Fouquet’s jewellery was in total harmony with its surroundings. Among Mucha’s works for the 1900 exposition, his murals produced for the Pavilion of Bosnia-Herzegovina, recently annexed to Austro-Hungary, have a particular significance. 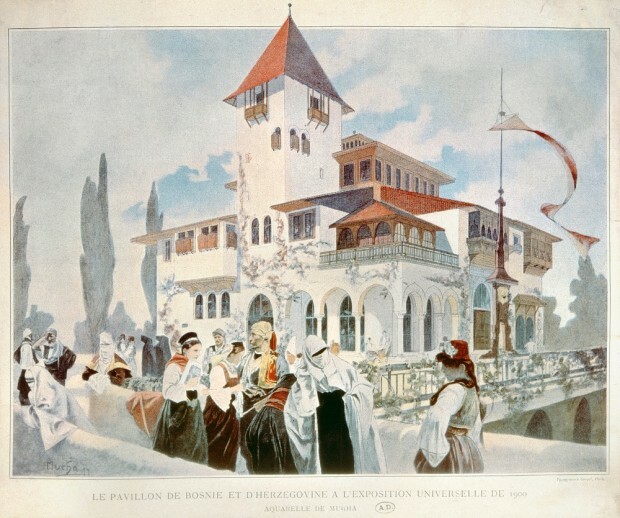 One of three pavilions exhibited by the Austro-Hungarian empire, the decoration of the Bosnia-Herzegovina pavilion was a highly prestigious commission; following the exposition Mucha was awarded the Order of Franz Josef I for his contribution towards the empire. Mucha resolved this problematic assignment by transforming the pavilion into a celebration of the history and the cultural diversity of Bosnia and Herzegovina. However, the theme that he truly wished to represent in the murals – the sufferings of the oppressed Slavs – would have to wait to be fully developed in his masterpiece, the Slav Epic (1911-1926). During this period, as if reflecting his internal conflicts, Mucha produced numerous charcoal and pastel drawings, which were dark, sometimes mysterious, and highly expressive with strong and quick strokes – a completely different style from the one familiar in his Parisian posters. Some of these drawings bear titles such as ‘Dead Women’, ‘Spectres’, ‘Soldiers in a Wintry Landscape’, others are based on Bosnian legends. In 1900 Mucha was at the height of his career in Paris as a versatile master of Art Nouveau, but he was facing a great turning point in his life and career. Where can i see this work?